TCT conference @ formnext is an educational platform. It features the industry’s most inspirational figures who share their experience on how 3D technologies are making a real impact in the manufacturing world. 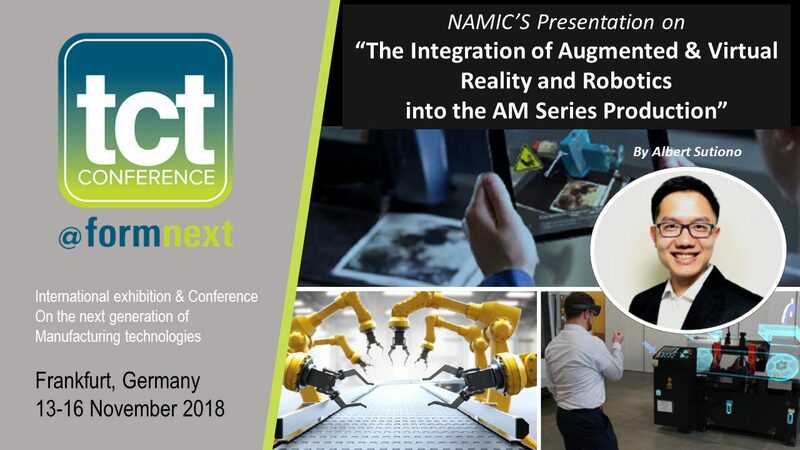 Come and join us to catch NAMIC’s presentation on the integration of augmented and virtual reality and robotics into the additive manufacturing series production. The sharing by NAMIC Head of Technology Grant Albert Sutiono, will be held on 15 November 2018 at 11:45am (local time) in the industrial challenges segment of TCT conference at formnext. Other highlights include the showcase of the latest trends from the world of 3D printing, discovery of the leading-edge technologies central to additive manufacturing and innovation in the design-to-manufacturing process chain.